Here's a couple more B-29 "knock-off's" I guess you could call them. Source of original photos are from the NARA Archives II, College Park, MD, RG 18 and posted on Retromechanix.com website below. Per Retromechanix: "The Boeing B-54A was the planned production version of the YB-50C and the final development of the B-29 Superfortress. It was powered by improved R-4360 Variable Discharge Turbine (VDT) radial engines. Wing span was increased by approximately 20 feet, necessitating additional outrigger landing gear in the outer engine nacelles. The larger wing imposed heavier loads on the fuselage, which was lengthened by over 10 ft to provide the requisite structural strength and accommodate a larger bomb load. The B-54A carried a pair of large 1,500 gal. fuel tanks under the outboard wing in order to meet the 9,300 mi. range requirement. The RB-54A, a photo reconnaissance variant of the design, was also planned. The bomber was equipped with the K-1 radar bombing system, which necessitated significant redesign of the fuselage. Lack of funding in the 1949 FY budget, along with General Curtiss LeMay’s preference for additional B-36s and B-47s, ultimately led to the type’s cancellation on April 18, 1949. Construction of the prototype B-54A was started but never completed. The photos and drawings are reproduced from a report on the Boeing B-54A mockup inspection, which was held in Seattle on November 22-24, 1948. In the document, the B-54A mock-up was described as a modernized version of the YB-50C airplane mock-up which was inspected by Air Force personnel on February 24-26, 1948, revised to incorporate the type H-1 armament system, 120 volt d.c. electrical system and various changes decided upon during specification coordination conferences between Air Materiel Command and Boeing personnel." Last edited by Mark Allen M on Tue Mar 25, 2014 3:43 pm, edited 1 time in total. Post subject: Re: B-54A & XB-44 ... The good ole days of lots of ideas ..
"Boeing/Pratt & Whitney XB-44 Superfortress, a B-29A-5-BN (s/n 42-93845) upgraded with Pratt & Whitney R-4360-33 Wasp Major radial engines of 3,000 hp each. These replaced the Wright R-3350 production engines rated at 2,200 hp each. The XB-44 program was initiated in mid-1943, when Pratt & Whitney proposed the engine upgrade to the USAAF; the contract was signed in July 1944. The company completely redesigned the four engine nacelles, adding a large air scoop underneath each cowling. Pratt & Whitney removed the majority of the bomber’s defensive equipment, as the type was intended strictly as an engine testbed; only a pair of machine guns in the rear fuselage remained. The XB-44 first flew in May 1945 and was demonstrated to be 50-60 mph faster than the B-29. The USAAF initially intended to produce the aircraft as the B-29D, but later changed the designation to B-50 to reflect the extensive airframe changes required and to improve the bomber’s chances of surviving the appropriations process—which it obviously did." Very interesting project there Mark! It appears his gunsight may have been a prototype for one of the waist installations instead of off a B-36. I've sent him an e-mail with a link to this thread, so maybe the vast knowledge base here can produce some more excellent history and info. Don't be too hard on Boeing & the USAF...after all, the B-29 was the most advanced aircraft (in terms of overall systems... IMHO, it was more advanced than the Me-262, which may have been more advance aerodynamically) of WWII and it was only 6 years old when that mockup was made. Also, remember at that time it was genaraly believed jets would use too much fuel for very long range ops. 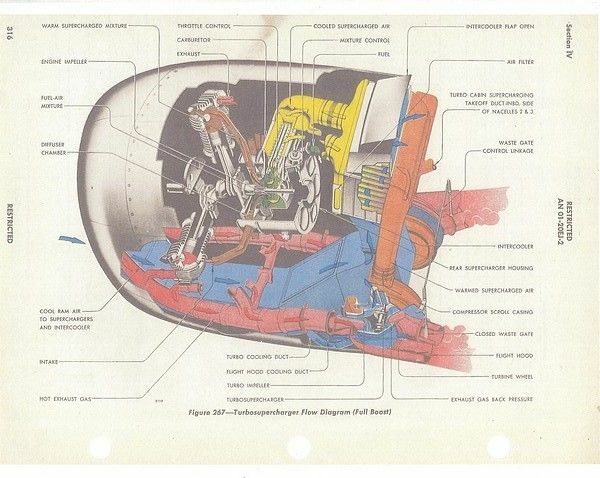 In at least one edition of the book Vision by Harold Mansfield it was recorded that Boeing engineers considered the B-54 to be a "re-tread" and had little enthusiasm for it; turbine power (with or without props) was considered to be a better solution. 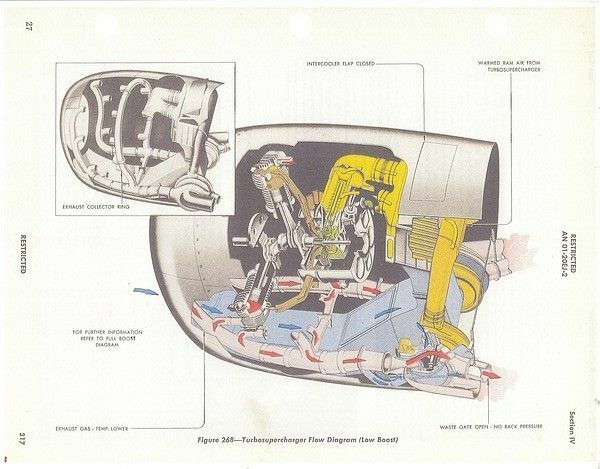 Clearly the VDT version of the R-4360 was at the end of that engine's development curve; it was also rejected for application on the B-36 because the wing would have had to be redesigned to move the engines to a tractor location instead of the pusher layout. Regardless these photos are fascinating and once again Mark has scored a direct hit. Thanks! Maintains database of B-17s used from 46- on. "Retread" was my thought too, when I saw those tunnels you have to crawl through between the work stations. Being as how problematic the engines were on the B-29's there were probably more than a few Air Force types that didn't want to see or approve anything that looked like, or smelled like, a B-29. A lot of friends and crew members were lost due to engine fires, etc. Harold Mansfield worked in public relations at Boeing; I'm not sure of his tenure but certainly in the 1950's. His book is an excellent read, particularly the early editions which have more detail about the formative years of the company. It is positive on Boeing, of course, but does tell the story with balance. Bill I love ya my man (no not that way either lol) but brother?!!! You sure have a way of going over my head. Either you really know your sh*t or your from a planet I've never even heard of ... Haha! Just funnin. Keep up the great input. Love learning from you, even if it does require an interpreter from time to time. I've always maintained a large compost heap of information between my ears . As I've seen it written in the past, with all the automakers doing war work (Oldsmobile manufacturing various calibers of cannons, Hudson building B-26 fuselages and SB2C wing panels, and other 'WTF??' contracts) The WD issued a contract to build 3350's to keep up with B-29 production rates to Dodge Bros. (Chrysler corp came many years later, after consolidation). They kept getting change orders for new cylinder baffling, cooling fin changes. etc. followed by conflicting C.O.s a few days later. The engine design group, not busy not working on the 1943 De SOTO engines dug into the engine and fixed a large number of nagging issues that seemed to have flummoxed WRIGHT engineers (recall that WRIGHT went from 'dig here' to an in production huge factory in 52 days). Coupled with decreasing the loads put on the engines in the Pacific and reducing the gross weights of the airframes by dumping the turrets and associated items eased the strain on the engines. The developmental work gave them incredible insight to just how efficient and really inexpensively a hemispherical head could be mass produced. Being a smaller, less layered company they took the ball and ran with it (Dodge,Plymouth/ DeSOTO were usually # 5,6,7 or worse in sales behind Studebaker, Nash and other now gone car makers and the conglomerate GM/Ford factories, Chrysler and Imperial were separate brands within Dodge, Studie and Nash had a full range of cars from 4 cyl, $475.00 new cracker boxes to really impressive big cars in what would today be in Mercedes territory, a 1929 Studebaker President is an awe inspiring vehicle) remember Ford refused to build MERLINS under contract because it 'wuz a 'furrin enjyne' and not our deesign neither' the contract went to PACKARD who had a strong reputaion of mechanical excellence and above it all pure craftsmanship. The WRIGHT/DODGE design was sound, since the new era 500 c.i. Funny car and Top Fuel motors, derived directly from those hard chargin' 245 C.I. 'Red Rams' put out 1200+ horsepower from 1 liter displacement x 8 for 10,000 H.P. from 500 c.i. A lot of it had to do with the 'can ya hurry the hell up!!?!! there's a war on' putting the cam plates between the banks and counting on ram air to handle the cooling issues. Rotating the front row cylinders 180 and putting the front bank cam plate ahead of the powercase went a long way towards alleviating a lot of the issues. Waiting for B-29 Flight Engineer to chime in on how touchy the airplane is to cowl flap configuration. Awesome photos! But I have to say the first photo looks like the illegitimate offspring of a B29 and the Oscar Meyer weinermobile.